Most shows have 80% of their downloads from Apple (iTunes) yet it’s always good to spend the few extra minutes to publish on all the top podcast directories. Especially because they are all FREE, for the most part. Before you do anything, decide on which company to host your show. Personally, 98% of my clients, including myself, use Libsyn. 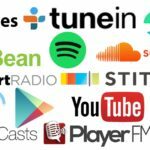 If you want more information about the other platform options, check out Dave Jackson’s podcast media hosting platform breakdown. After you set up hosting, validate your RSS feed: Castfeedvalidator.com. iTunes – Create an Apple ID first here. Stitcher – Scroll down, enter info, click > continue. Spotify – Find your host and follow their instructions. Personally, I submitted with Libsyn. Google Play – Click publish > add a podcast > accept terms & submit your RSS feed. Google Podcasts – Paste in your RSS feed and click generate. Pandora – Fill out ‘Intake Form’ to submit. TuneIn – Fill out entire form to submit. Soundcloud – Click upload to free > upload your first track. (This can be synced with Libsyn’s distribution system). Youtube – Convert your audio into a video and upload it to YouTube. (This can be synced with Libsyn’s distribution system). Acast – Click “Get Started” under the “Hosted Show” option. RadioPublic – This can be submitted via Libsyn. Otherwise, copy just your RSS feed > Go. Pocket Casts – Enter your podcast feed URL. Podbean – Create an account > scroll down to ‘submit your podcast’ > submit your RSS Feed. Podkicker – Submit RSS feed and confirm security code. Player.FM – Search for your show and if you can’t find it click “import the feed directly’ and submit your RSS feed. iHeartradio – This can be submitted through Libsyn’s after two months.